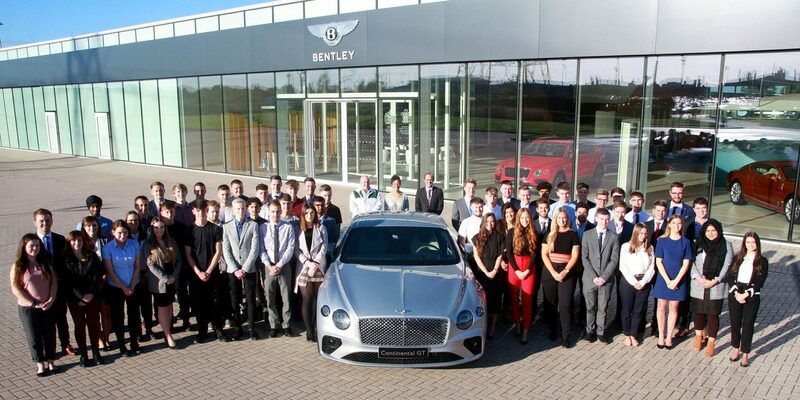 Bentley Motors has welcomed its new intake of apprentices, undergraduates and graduates to its 4,000-strong workforce as the company prepares to celebrate its centenary year. The 83 new recruits cover commercial areas such as sales and marketing, communications, people and digital, finance and purchasing, as well as the traditional engineering and manufacturing departments. Out of the 83 new recruits, 40 apprentices start training at the company’s headquarters in Crewe, bringing the current number of apprentices to almost 140. Half of the apprentice intake will follow a three or three and a half-year Advanced Apprenticeship programme while the rest will study for a Higher or Degree Level Apprenticeship. This includes three former students of the Crewe Engineering and Design University Technical College (UTC), of which Bentley is a supporting partner. 12 graduates will follow a two-year development programme which will see them working on key business projects that will serve as starting blocks for successful business and engineering careers. The undergraduate scheme, with 31 new recruits, offers a 12-month development programme focused on degree students looking to complete a year out as part of their studies.